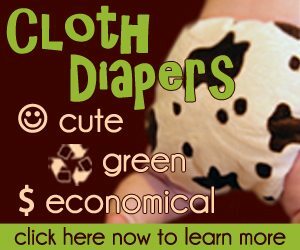 Need Help with Cloth Diapers? Are you curious about cloth diapers but confused by the sea of cloth diapering information available today? My eBook, Confessions of a Cloth Diaper Convert, answers every cloth diapering question you will ever have–and more. Do you want to ditch the disposables but your spouse is unsure? Do you want to invest in a stash of modern cloth diapers but are afraid of washing them the wrong way and then ruining them? Have you tried to use cloth diapers in the past but gave up because they got too stinky, too leaky and gave your baby a rash? Do you want to save money on cloth diapers but don’t know how to afford the upfront costs of a stash of modern cloth? Are you using cloth diapers now and want to learn how you can help advocate for them and use cloth diapering to bless others? Take a deep breath: I’m here to help. There were so many cloth diaper types on the market that I felt utterly confused. My husband wasn’t open to using cloth diapers. And we couldn’t even afford the initial investment. But we were incredibly blessed with a charity loan through a diaper lending non-profit. The organization sent us 12 diapers for each child, and I got to experience first-hand what it was like to use every diaper type available today. I quickly fell in love with using cloth diapers. It became a passion. But it wasn’t an easy transition. I made every cloth diapering mistake in the book. I washed them the wrong way. I ruined several diapers with diaper cream. And I almost quit using cloth diapers when my daughter developed a yeast rash that spread to the diapers. But through it all, I persevered. I troubleshooted and experimented until using cloth diapers became just as easy as using disposables. I’ve now saved my family thousands of dollars. So how did I learn so much about cloth diapering? Being the recipient of a cloth diaper loan gave me a very unique perspective: I got to experiment with every diaper type. Unlike some cloth diapering mamas who try one type and stick with it for the long haul, I’ve literally used every kind of diaper available today–from flats and prefolds to pockets and all-in-ones. I then started working for a cloth diapering store. The owners of the store saw how much I had educated myself on cloth diapers and gave me the job of helping other cloth diapering mamas troubleshoot their problems and discover which diapers would work best for their babies. The owners continued to train me until they knew I could answer any cloth diapering question. During my time at this job, I helped hundreds of parents learn how to successfully cloth diaper their babies. I’ve written this book to help save you the time it took me to research and the frustration I experienced when I encountered challenges. This book can help you overcome any cloth diapering challenge. And if you read it before you even start, you may just eliminate any challenges all together. At just $12.50, this 200+-page book costs less than what you pay to use disposable diapers for one week. Buy it now, and start your cloth diapering journey off right. Save yourself time and frustration. Before you know it, you’ll be a cloth diaper convert! Want to check out the entire Table of Contents? View it here! Download your PDF copy of Confessions of a Cloth Diaper Convert for just $12.50!